A small note before we dig in today, Gentle Readers. I previously said I had no testimony from Josiah Hargis or Harrison Buckley regarding Coleman’s murder of Dow. I have since found a pair of affidavits elsewhere in Brewerton, but neither sheds much light on the shooting itself. We left John Banks in the somewhat unwelcome company of Jacob Branson’s group of fifteen or so men hunting after Franklin Coleman. They had gone up to the home of Coleman’s neighbor Hargis/Hargous, where Mrs. Coleman then stayed, after searching the Coleman residence itself. Hargis, Banks, and a fellow called King went up to meet them and, one presumes, see they didn’t harm the building or Mrs. Coleman. Branson stopped Hargis for questioning, insisting that he had to know where Coleman ran off to and not believing his story about a trip to surrender himself to Governor Wilson Shannon. 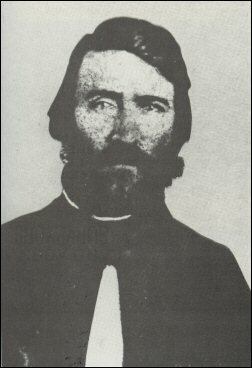 No move was made by Samuel J. Jones, Sheriff of Douglas County, K.T., to arrest the murderer. This may have been a deliberate prod to free-soil emotions; it may have been in simple keeping of territorial custom, since there had been numerous killings and few arrests; or perhaps the strongly proslavery Mr. Jones was just too busy with his duties as postmaster of Westport, Missouri, at the time, to attend to his territorial police duties. Whatever the cause, his ignoring of the murder angered free-soilers. Nichols generally reads proslavery men with some charity, so that she finds it unusual and potentially damning suggests fairly strongly to me that malice played its part. Jones’ record back at the Assembly elections in March, where he and a band of proslavery men stormed the polls and demanded the judges of election resign at gunpoint or be killed on the spot, does not suggest the sort of impartiality one would hope for in such a case. This delay becomes more conspicuous with a closer look at the timeline. My sources, who testified months after the fact, don’t all agree on what happened when. Nichols dates the shooting to November 21, a Wednesday. This date, I’ve come to realize, appears more consistently in the records than Coleman’s recollection of the 27th. Coleman dates his departure to the night of the shooting, right after he got warning about the Kansas Legion. Banks heard of the shooting the same evening, but did not go up to see the Colemans until the morning. This places his encounter with the mob on Thursday morning. However, Banks testifies that he started after Coleman the next morning after that. This should put him on Friday, but he testifies that he began out on Saturday. If Banks remembered the day of the shooting wrong, then Branson’s mob could have stewed for a few days. If he has the date of his encounter with them and the dates thereafter wrong, then they waited less before trying to take matters into their own hands. Banks and Coleman can’t both have it right. I suspect that Coleman might have chosen to wait until morning rather than go off alone into the night when he knew men might want his head, which would help reconcile things, but I can’t fairly call that more than speculation. Does all of this matter? Maybe not, but the Dow killing marks a significant escalation over past violence. While it arose out of a land dispute, the principals appear not to have deeply invested themselves on the slavery question beforehand. Coleman worked, apparently easily, with free soil men. They in turn don’t seem to have found him obnoxious. While Branson and Jones had clear affiliations, Dow doesn’t appear to have joined up with the Kansas Legion. Coleman, who knew of Branson’s affiliation, pass on any suspicions to that effect. If he had them, one would expect him to do so. Here we find a pair of at least relative civilians, very much unlike Patrick Laughlin and Samuel Collins, in the somewhat unwitting process of joining in the brewing Kansas conflict. If the delay factored in, then it helped escalate matters in the previously relatively peaceful Hickory Point area. That escalation would soon have larger consequences. This entry was posted in Bleeding Kansas, Road to War and tagged Charles Dow, Franklin Coleman, Jacob Branson, Kansas Legion, Popular Sovereignty, Violence.